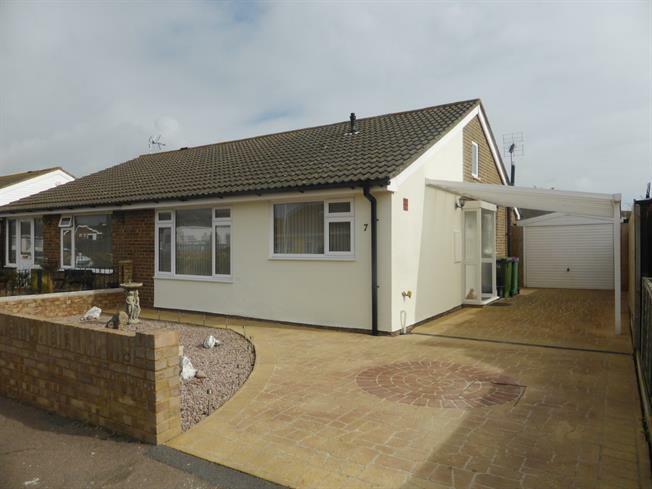 2 Bedroom Semi Detached Bungalow For Sale in Romney Marsh for Asking Price £250,000. Beautifully presented two bedroom semi detached bungalow with garage, carport and off road parking. The lounge/diner is to the front of the bungalow. Modern kitchen with range of wall and base units and sink unit set in work top, built in gas hob, electric oven, fridge/freezer and dishwasher, washing machine. Good size master bedroom. The second bedroom has door leading to the rear garden. White bathroom suite comprising P shaped shower/bath, wash hand basin set in vanity unit, concealed cistern WC, stainless steel towel radiator. The rear garden has a summerhouse. Paved driveway providing off road parking for several cars, carport and garage.